A local street food of Italy, in the Liguria Region, Farinata is definitely a comfort food that feeds your soul too. It is thicker than a crepe, thinner than a pancake, more like a thin crust pizza base & can be eaten like a pizza – plain, stuffed or topped. Very similar to the Indian Lentil Crepes like Chillas & Adais, Farinata is a GLUTEN FREE delight, made of chickpea flour. “Farinata is a type of baked Italian pancake, or more accurately a flatbread, since pancakes tend to be sweet and farinata is a savory food. Generally, farinata is considered a street food, and it is closely related to pizza, often served with pizza toppings or used to wrap pizza-like ingredients. When traveling in Mediterranean regions of Italy, farinata is often offered as street food. It can also be made at home. Well, this recipe did not go as planned. I had everything at hand, ready to bake the farinata in the oven & my oven stopped working! I had used the oven the day before, & it did not give me any warning. I just had to go about making this without the oven. I did it on the stove top. It did not turn out to be much different. If you want the preparation of the Farinata in the oven, I have it here. Today I’ll only write the stove top method. Coming to think about it, I was pretty happy I did it – it took less time, cooked pretty well, nice golden crispy & now I know another way to do it. Note: Use vegetables as per your preference. Mix the water and the flour with a whisk, making sure there are no lumps, add salt and mix again. It should have the consistency of a crepe batter. Let it sit for atleast 4 hours (Or even better overnight. I did it for about 4 hours). Coat the skillet with 1 tablespoon of Olive Oil & heat till almost smoking hot – a drop of water on the skillet should make it sizzle! Make sure here before you pour the batter that the pan should be at level; if not the farinata will be thicker on one side & thinner on the other. Skim off the surface foam from the batter. Whisk in the Freshly Ground Black Pepper & herb with the batter. Pour the batter in the hot skillet & turn it around for it to spread evenly. (mind it the skillet is HOT). Cook for about 2 minutes. Reduce the heat to medium & Cover the skillet & cook for about another 3-4 minutes or till the top of the farinata seems dry & you will notice tiny bubble like holes on the top. Do a toothpick test. It should come out fairly clean. The sides should start to crisp & brown by this time. With a spatula, try to lift one side. If you see that the underneath is golden yellow & with brown spots, Carefully loosen the sides & the underneath & flip it over; make sure not to break the farinata. (If you find it difficult to lift it, cook for some more time at a higher heat). 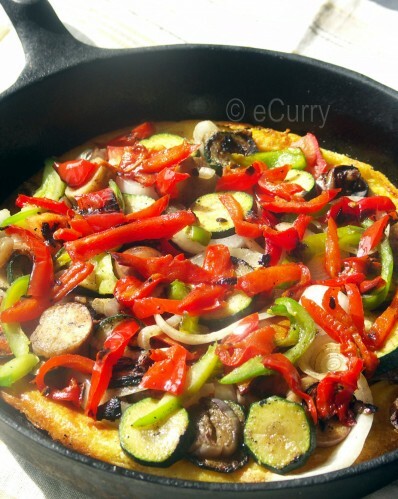 Top the farinata base with the grilled vegetables you had set aside earlier. Increase the heat of the stove till the bottom & of the base is crispy golden/light brown. Once done, take it off the heat. Serve warm while still crispy. Slice it; Garnish with more freshly ground black pepper. 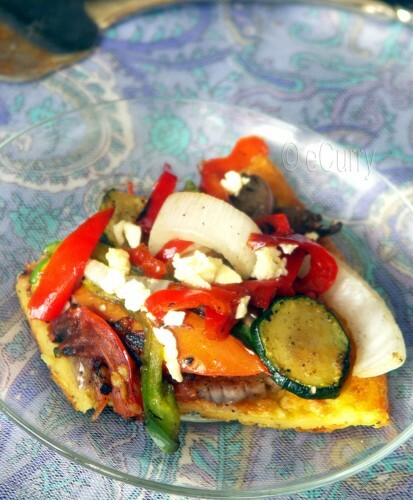 & serve just by itself, or topped with Marinated Feta Cheese, like I did on my share. Now would you feel guilty indulging in this colorful summer treat? I would not. We all love Farinatas! A Gluten free, veggie loaded is snack always sings to our soul & fulfills it too. Sending this to HOTM, hosted by dear Ilva of Lucullian Delight. The theme this month is June’s Best Produce. I have all the wonderful vegetables here that the pretty summer has been offering us. For a party, it is a great idea to serve slices of farinata, with an assortment of topping. Allow the guests to pick & choose their own topping on their slices. Use any topping you would use on a bruschetta or a pizza; fresh tomatoes, grilled veggies, cheese, chutney are a few of them. The way you explain about the dish makes me drool double. This looks so so yully and love the colours too. Delicous. Sounds really good. I’ve been meaning to try farinata. Thanks for the information about Farinata. I have not had it before. 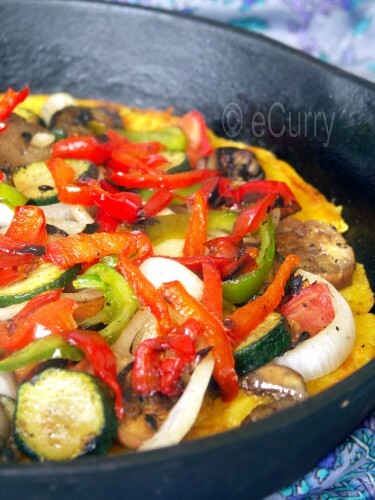 Sounds delicious with grilled veggies! Ooooh! totally digging this farinata with a pizza topping! Your pictures are making me so hungry girl! I love how you by accident found that the cooking of this dish was better in the cast iron pan!!! Yep these kitchen appliances will not give one a warning! It will let you down right in the middle of an important culinary masterpiece! Soma, may I ask you a question please? I cannot seem to link back to other blogs via the comments left on my new site (Word press). Like for example, in order to come to you, I had to go back to blogger and find an older comment of yours to come here. Can you help me (nazarina@karston.com) Thanks. I am asking you because you have the same kind of comment section set up that I have. I haven’t seen a farinata before, but it sure looks delicious! Wow looks very colorful and very healthy. Nice dish, lovely presentation. Never heard of this..Looks absolutely wonderful like pizza..
Eta ektu chilar moton tai na … shudhu oto patla noye. Grill veggies add kora te nischoi alada flavour ashe. Farinata looks delicious! the best part is that i can use whatever topping i like! wow sounds like a perfect breakfast. Nice explanation thanks for the recipe yum. wowwww i loved this very much!! And these days i am upto such grilled things!! So its a must try for me!! 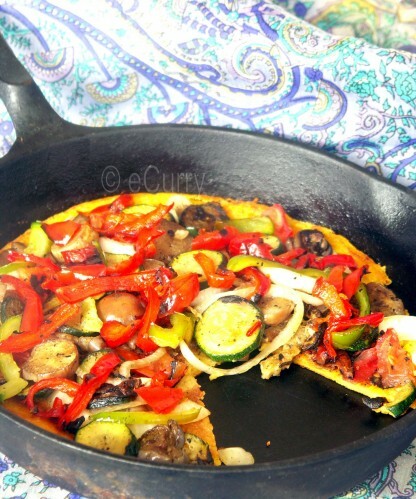 I haven’t seen Farinata before, but looks absolutely delicious….your pictures are amazing! Looks delicious. Love the one in the pan. Your toppings look delicious! I like the idea of trying this on the stovetop too. Good to learn about this delicious-sounding dish, Soma. The colors are so appetizing. And I was tickled to see your cast-iron skillet: I just wrote at length about how much I love mine! 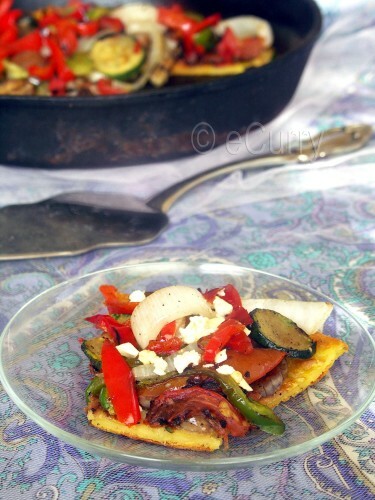 The photos offer great inspiration to make the Farinata. – which I have never heard of by the way. It sounds unique and irresistable. Will give it a try. Grilled? do i hear correct…amazing, was looking forward to a blog with some grilled recipes…good to have landed here!!! Farinata as stove topped, really very new…i was surprised to see chickpeas flour have been used in this recipe..looks fabulous Soma! I’ve seen Farinata on the web, though never tried it yet. Yours looks awesome! I am drooling over this !! Looks so fantantic with all the healthy ingrediants !! I just cant wait to try this out. I’ve never heard of farinata before, so it’s always great to learn new things. I love crepes and pancakes so I am sure I would like this although I never eat savory ones as I have a sweet tooth. Yes, these are like the Indian Chillas – for those of who are familiar with it, except for the way it is cooked traditionally. Ahhh, nice! A vegetarian street food and the chickpea flour is a fave of the Italians. This is very colourful and most appetizing. Soma, this just what we wanted this month in HotM! Thanks a lot! Wow,delicious.Love the post.I am yet to try this.Too perfect summer treat Soma.Nice explanation you have given as well. This looks great; very healthy and delicious. I just made farinata for the first time this weekend. Wow, I love it! And I love the idea of using it as a pizza base. Beautiful pictures, btw. I am a student that is participating in Marylands National Restaurant competition. I used your farinata recepi and I need to site this web page. I was looking all over the website to find a name. What name should I use in order to correctly site this webpage. All I need is the authors name. I’m really positive on how you will reply but if you can email me at C_Guevara88@yahoo.com that will be great. Thank you so much, I very much do apreciate it. Sorry I forgot to include that I needed the city and state that it was published in; sorry I just need to correctly site this webpage for the recipe in MLA format. Thanks again.